Canadian orders: please pay in Canadian funds (postage included). USA orders: please pay in US funds (postage included). International money order, cash, cheque, or Paypal. INTL orders: Please pay $14 in US funds. International money order, cash, cheque, or Paypal. INT'L: Asia & South America only. Johnny Dowd is an American original: His is a singular musical vision distilled from the raw detritus of primal rock and roll, free jazz, swamp blues and greasy funk, all anchored by a voice channeling Johnny Cash through Chet Baker. 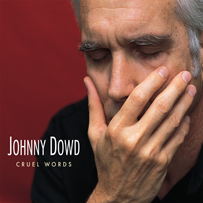 Cruel Words, Johnny Dowd's sixth album and second for Bongo Beat, follows a trajectory set in motion by the self-released Wrong Side of Memphis in 1998. Johnny was 50 years old at the time, working at Zolar Moving Company in Ithaca, N.Y., by day and recording in their offices by night (it's ok, he's one of the owners) - a pattern that hasn't changed much over the years except for Cruel Words, which was recorded at Ithaca's Pyramid Sound with longtime friend and engineer Alex Perialas. It's no surprise that Europeans were the first to embrace him. Here was a fully formed character who'd emerged from nowhere, a guitar-toting white-haired James Dean flashing a sly grin as he casually handrolled a cigarette during the course of a song. Born in Ft. Worth, Texas, Johnny spent his childhood in Pauls Valley, Oklahoma. "This is where my musical education took place. I had a pair of pointy shoes and a red shirt that I wore when I pretended to be James Brown." After his parents divorced, the family moved to Memphis, where Johnny got his first guitar. Dowd's musical canon cuts a wide swath across the fringes of American music, twisting and prodding each form into something it shouldn't be: country funneled through free jazz, an Okie drawl crooning over swamp psychedelia. It all becomes a little clearer when you're told that his two favorite records as a kid were James Brown's Live at The Apollo and Hank Williams as Luke the Drifter, a yin-yang template that frames the Johnny Dowd songbook. Cruel Words raises the stakes considerably. The core trio of Dowd (guitar, vocals), Brian Wilson (drums, bass pedals) and Mike Stark (keyboards) is joined by Mekons' Sally Timms and Jon Langford on the standout "Drunk." The album also marks the return of longtime Dowd backup vocalist Kim Sherwood-Caso to the fold. There's an almost Kerouac sense of naive wonderment as Johnny chronicles the desperate measures of the marginalized characters in these songs, displaying a Brothers-Grimm view of the forces conspiring against them (sometimes with their own complicity). "You're not the father of the child that I carry," taunts the title character of "Unwed Mother," while the wheelchairbound war vet of "Praise God" questions the price paid for loyalty. Longtime live-set closer "Johnny B. Goode" reprises that role here with the same jarring effect: when did THIS song become so threatening? Released in Europe in February 2006, Cruel Words arrives on our shores with 4-and 5-star reviews from every influential UK publication, including Mojo (4 Stars, "as much jazz as roots music, as much poetry as rock"); Maverick (5 Stars, "Johnny Dowd is a law unto himself"); Classic Rock (8 stars, "the songs are quirky but they rock"); Time Out London (5 Stars, "Gothic Folk Funk"); Daily Mirror (4 Stars, "wit and wisdom to match even the late great Warren Zevon"); and The Independent (5 Stars, "may be the greatest album of his career"). Following a very successful European tour, Johnny is set to swing through the US and Canada starting in late July. The records can only prepare you so much for the live experience: Johnny's ramshackle music-stand tottering under the weight of his lyric book, the dry-wit delivery of between-song vignettes and a casualness reminiscent of Dean Martin (believe it or not). But don't be fooled, there is more craft going on than Johnny lets on (for example, he's a stunning guitar player no matter how casually he may downplay it). "This was an easy record to make," says Johnny. "We had been playing the songs live for almost a year, so our plan was to go into the studio, cut the songs live with a minimum of overdubs or other studio trickery." Recently Johnny's riveting performance in the British documentary, Searching For The Wrong Eyed Jesus (hosted, starring, and inspired by Jim White) has gotten him considerable attention and led to forming a group with Jim White and drummer Brian Wilson called Hellwood (album and tour for Europe only). Cruel Words is a career-defining work - the quintessential distillation of Johnny Dowd's America, a guided tour into the dark heartland of all that is uncomfortably familiar.